With need to improve connections throughout the south-eastern alps of Switzerland, the Albula Line naturally became one of the most picturesque railways in the world. Home to the famed Glacier Express, and owner of UNESCO World Heritage status, there is no doubt that this line is one of the best there is. Following the formation of the Rhaetian Railway (RhB) in 1890, plans were put into effect which would increase the somewhat lacking number of railway lines in south-east Switzerland. 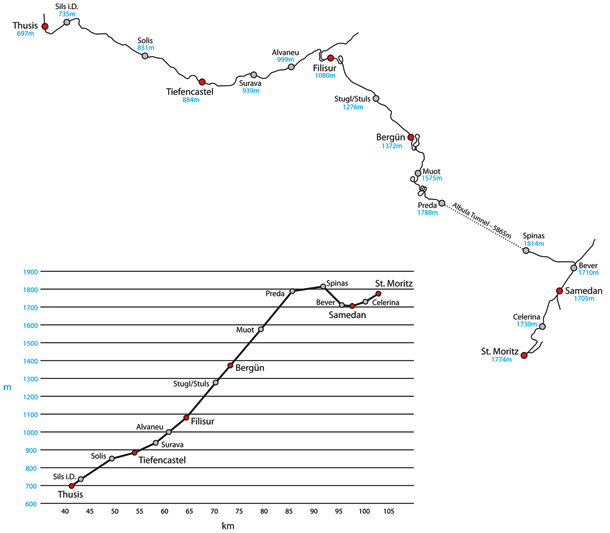 Multiple proposals were put forward for the new line's route with the eventual result settling on a pass through the Albula Valley to connect Thusis and St. Moritz. The altitude difference throughout the Albula Valley meant that the maximum allowed gradient of 3.5% was not enough to connect the towns throughout the pass. The answer would be to artificially extend the railway. Using a combination of curved tunnels, spiral tunnels and viaducts, the builders carefully brought the railway to the right altitude while staying within the parameters. One other vital structure to the railway is the Albula Tunnel. Stretching across 5866 metres, this tunnel is among one of the highest alpine tunnels in Switzerland and passes under almost a kilometre of mountain above, avoiding the Rhine/Danube watershed. Services began to operate across a majority of the line with its opening in July 1903, these services were not complete though. The debate between RhB and the St. Moritz municipality on where the town's station should be based was still ongoing, and as result the full line did not open until one year later. In the late 1920s, the vision of connecting two Swiss mountain resorts was on the cusp of being realised. An express service, between St. Moritz and Zermatt, would be ideal for both locals and tourists alike and it was not long before such services began to operate. This service was named the Glacier Express. With such sharp turns and steep gradients, the Glacier Express traverses the line at an average of 39 km/h, making it amongst the slowest, yet most beautiful in the world. With unique infrastructure helping to obtain captivating views, it is not surprising that this stretch of railway is recognised as a UNESCO World Heritage site. The Albula Line is unlike any other. The Albula Line for Train Simulator features the 64 km line from Thusis to St. Moritz via the Albula Valley. The entire line comes complete with a high level of details throughout; everything from 3D, metre gauge track to animated ski resort cable lifts, towering viaducts and spiralling tunnels. The RhB Ge 4/4 iii electric locomotive is included, featuring all RhB liveried examples each with their own unique coat of arms. The locomotive comes with advanced features such as dynamic pantographs that follow the catenary wire height, various driving modes, ZSI-90 safety system and much more. Lb-v container flat wagons and the Glacier Express' panoramic and restaurant coaches are also included, complete with a highly detailed passenger view. A selection of Career scenarios are included, alongside Railfan Mode scenarios and Thomson Interactive have introduced a Train Simulator first, Passenger Mode. There is no better way to experience the Albula Line than from the luxurious panoramic coaches, don't worry about the driving, just sit back, relax and enjoy!